By Terry Techno Aura Spring 2017 Collection : Fancy or Just Dodgy? By Terry Techno Aura Glow-Expert DuoStick. Blush-Bronzer-Highlighter, two-tone 3-in-1 hybrid stick inspired by the latest contouring and strobing techniques, with integrated blending brush. Enriched with glow-reflecting prisms and light-correcting micro-spheres, it enhances facial features for a natural healthy looking result. Its ultra-creamy texture perfectly melts on bare skin or over makeup to capture and diffuse light. You'll LIKE it if you love the creamy texture and satin finish on the skin. You'll HATE it if you are expecting a lot from the brush because it takes a lot of time to blend with the brush given. Speaking of glow, this blush and highlighter duo is heading over by the everyday makeup load. 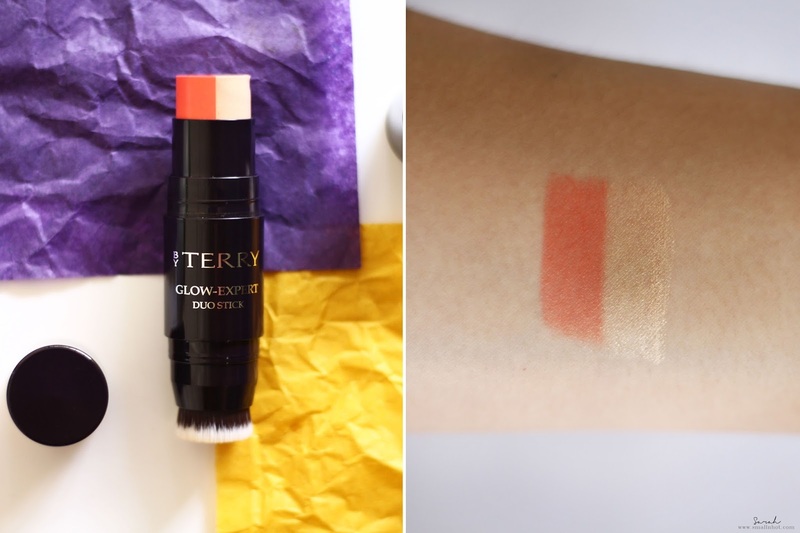 Of all honesty, I do not fancy blusher or highlighter in a stick because it always takes time to warm up the product and then pad on my face, but this DuoStick has converted me! It's so creamy that it melts as I glide it onto my cheek, nose bridge, cupid bow and eyebrow. It transforms into a slightly glowy and satin finish highlighter and blusher that makes me look like I had actually drunk 8 glasses of water and 8 hours of beauty sleep the night before. Really Loving it ! However, I find it really hard and time-consuming to blend the products in with the brush given. 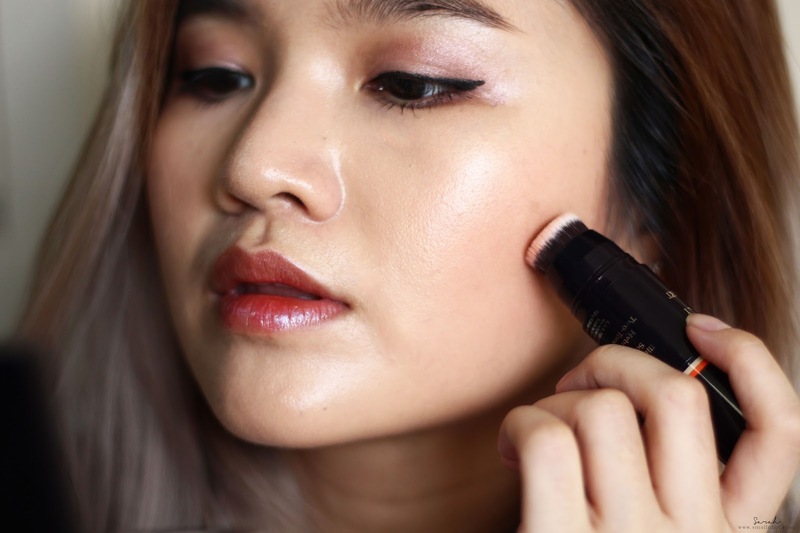 If I am running out of time to blend, I will use my Sigma Flat Kabuki Brush instead. By Terry Techno Aura Eye Designer Palette Parti-Pris. Terry de Gunzburg brings even more colour with this palette of six eyeshadows capturing the latest trends. Rich in micronized premium pigments and extra-fine powders, the easily blendable soft texture offers supreme comfort, even coverage and durable colour. You'll LIKE it if you like subtle and natural eyeshadow colour. You'll HATE it if eye primer is an extra step for you. 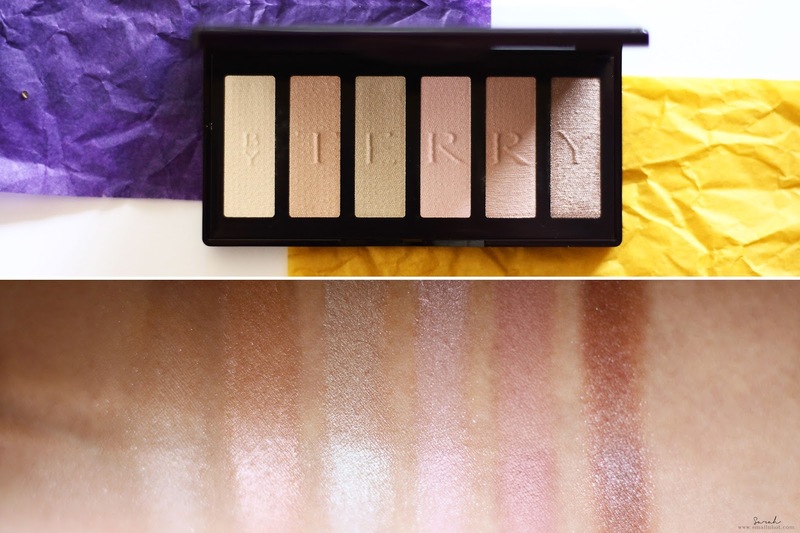 I just can't get that excited about this Eye Designer Palette Parti-Pris. Maybe a couple year's ago when I was introduced to makeup for the first time, I would have gone crazy over the pretty pastel colours that this eyeshadow palette offers, but after playing with numerous of eyeshadow palettes from different brands, this kinda puts me off. I tested it out by creating a few looks with the palette and the colours are nice, creamy, minimal fallouts and very blendable, but the thing that turns me off is the fact that I have to pile on quite a lot of products on my lids just to get a good colour payoff (even with eye primer). If you don't mind spending a little more time on the eyes, then go ahead, but for me, they're a little underwhelming and I rather be putting my money elsewhere for a more pigmented palette. By Terry Gloss Terrybly Shine Hydra-Lift Lip Lacquer is ultra-shiny, lift-firming, volumizing lip lacquer plumps-up the smile with long-lasting glow. The age-defense Lumilip technology combines nutri-regenerating ceramides, hydra-filling hyaluronic acid, collagen-stimulating peptide, plumping "Kiss Me Quick" plant extract and anti-wrinkles correcting prisms. The modelling nourishing, smoothing, non-sticky texture with "High Shine" spotlight effect flatters the smile with terribly luxurious colour. You'll LIKE it if you are looking for some unique, high shine and hydrating kind of lip lacquer. You'll HATE it if longevity is what you are expecting from the product. 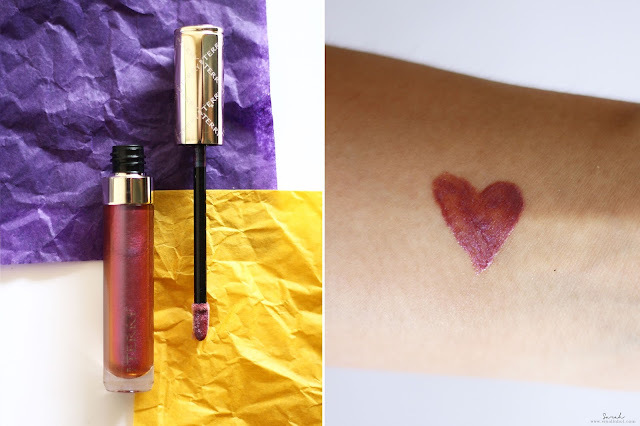 I don't think I've ever seen such a pretty lip colour... For me, this lip lacquer kind of ticks all my lip product criteria except for the longevity, which I can overlook due to the pretty iridescent colour. You could basically forget all your lip lacquer and apply a serious amount of your lips and you'll be party-ready in a minute. It sets on my lips with no feathering and comparatively very hydrating too, at least my lips don't yearn for water after 8 hours of wearing it. You don't need to use a liner with this because the dopher applicator gives you a decent amount of precision. The iridescent colour also means that you'll get different colours when seen from different angles. Overall, the By Terry Techno Aura DuoStick and Gloss Terrybly Shine Lip Lacquer tickles my fancy and it's definitely a keeper, but the Eye Designer Palette Parti-Pris is probably going to end up on the giveaway pile.